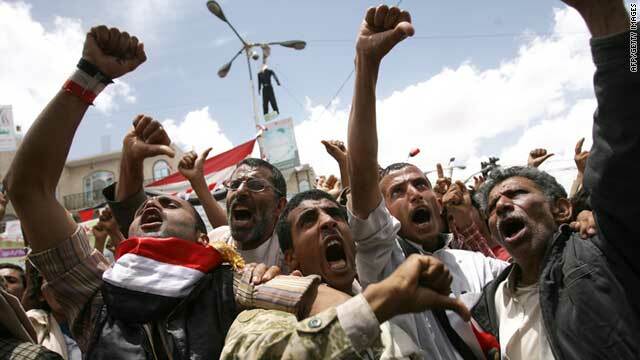 Anti-government protesters call for the resignation of Yemeni President Ali Abdullah Saleh, in Sanaa on May 23, 2011. (CNN) -- Yemeni President Ali Abdullah Saleh called Tuesday for tribal leader Sheikh Sadeq al-Ahmar to halt the violence that killed at many as 41 people Tuesday even as opposition groups and tribes blamed Saleh for the carnage. Saleh cited the northern neighborhood of Hasabah in Sanaa, where Yemeni state television reported that al-Ahmar's forces were directing heavy gunfire at a police hospital. As video showed burning buildings, Saleh asked for al-Ahmar's sons to order the insurgents to evacuate the public places and buildings they were occupying. The television report did not release casualty figures in the attack. According to al-Ahmar's office and medical officials, 17 men from the main opposition Al-Hashid tribe were killed in clashes Tuesday -- deaths that al-Ahmar's office blamed on Saleh. "Saleh is putting into practice what he said about Yemen entering a civil war," said a senior member of Sadeq al-Ahmar's office who was not authorized to speak to the media and asked not to be identified. "The tribes of Yemen will join hands to stand against Saleh." According to the Interior Ministry and Abdu Ganadi, the government spokesman, 14 soldiers and 10 civilians were killed in clashes Tuesday. "These tribes are loyal to the al-Ahmar family, and they are the reason innocent civilians and security forces were killed today," he said. In the city's Change Square, a witness told CNN that soldiers who had defected from the Yemeni army were moving to protect protesters who had gathered there. Earlier Tuesday, witnesses told CNN that nearly three dozen people were wounded during clashes Tuesday between government security forces and members of the Al-Hashid tribe at al-Ahmar's residence. Seven mediators -- who were trying to broker a cease-fire between Saleh ad the al-Ahmar family -- were wounded, a senior official with al-Ahmar's office said. One member of the mediation committee blamed Saleh for the attacks. "The al-Ahmar family agreed to stop fire and Saleh knew that," said the mediator, who was not authorized to speak to the media and asked not to be identified. "We were on the phone with Saleh telling him that Sadeq al-Ahmar will stop using force. Saleh did not listen and, minutes later, a missile hit the house." The mediator added, "For this, we step aside from our mediation and stand on the side of Sadeq al-Ahmar against Ali Abdullah Saleh." Tuesday's violence marked the latest round of clashes in Yemen, a key U.S. ally in the fight against al Qaeda. The country has been roiled by protests for most of the year amid anti-government demonstrations that have swept across much of the Arab world. Protesters want Saleh to step aside after three decades of rule. The fighting came after Persian Gulf states said Monday that they had suspended efforts to ease the embattled president from office after he once again balked at signing a deal with opposition leaders. In a statement carried by the Saudi Press Agency, foreign ministers with the Gulf Cooperation Council said they were dropping the deal "for lack of appropriate circumstances for agreement." The council is made up of representatives from the United Arab Emirates, Bahrain, Saudi Arabia, Oman, Qatar and Kuwait. Under its plan, Saleh would have ceded power to a transitional government after 30 days. Opposition leaders signed the pact Saturday, but Saleh said he would not go along unless the opposition re-signed the agreement in a public ceremony at his presidential palace -- which was surrounded by armed, pro-government protesters. Opposition members have long contended that Saleh had no intention of signing the agreement. On Tuesday, Britain's minister for the Middle East, Alistair Blair, called Saleh's continued refusal to sign the peace agreement "a matter of the deepest regret to the United Kingdom." He added, "He is now isolated from leaders in his own party and the opposition who have demonstrated their commitment to a peaceful transition of power. The GCC initiative represents the best chance to achieve a peaceful settlement to the political crisis."